If you search your ancestors in Sarno, Campania, info about your Italian family are stored in the City Office archives or at the parishes. In towns and villages of Campania and in Salerno province registry offices were established in early 1800: it means that you could find information in Sarno registrar as of that date. So, if your ancestors were in Sarno in the nineteenth or twentieth century, then you could try to contact the City Office of Sarno to know more. Before to start your genealogy research in Sarno, we suggest you to read our tips for your search . They are useful to search in Campania and in Sarno too. 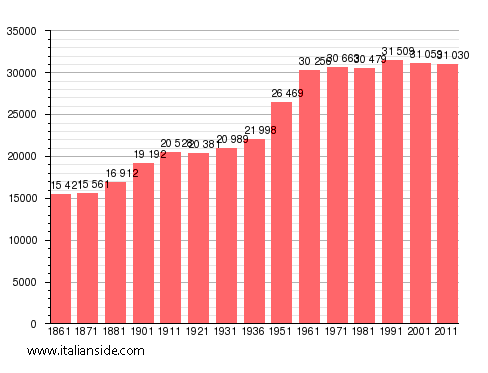 Next picture shows the demographic trends in Sarno from the Italian Unification (1861) an important info to understand how many people lived there in the past. It could be important to know if the last name you are investigating is a frequent surname in Sarno. As more your surname is common in Sarno, as more it could be difficult to find the right info about your ancestors in Sarno archives if you have not exact dates. Alfano, Amato, Annunziata, Apicella, Bruno, Califano, Caputo, Cirillo, Coppola, Cuomo, D’Amato, D’Ambrosio, D’Angelo, De Luca, De Martino, De Rosa, Esposito, Ferraioli, Ferrara, Gallo, Giordano, Greco, Grimaldi, Iannone, Lamberti, Landi, Manzo, Marino, Napoli, Pagano, Palumbo, Pellegrino, Pepe, Rinaldi, Rizzo, Romano, Ruggiero, Russo, Santoro, Senatore, Sessa, Sica, Sorrentino, Tortora, Trotta, Vitale, Vitolo, Volpe. Church archives in Salerno province may instead contain even older information, but they are far less accessible from abroad (and almost impossible by email). Then,parishes send information not easily. If you have the opportunity to visit Sarno and Salerno province, you could plan to investigate churches’ archives by yourself, but from abroad is very difficult to obtain any result unless you find a reliable local help. If your research is in a dead end and you need professional help from our local Italian genealogists write to sarno@italianside.com our expert in Sarno area will study your request and will reply to you with a research plan and a quote. My great grandfather , Ignazio Merola , came to NY December 19, 1908 from Naples. He was from Sarno. Would love to find out any info . Wouldn’t even know where to start looking . My father just passed away and we never got to really research together. I am trying to find information on my ancestors who I believe are from Sarno, Italy. My grandfather’s name was Dominic (Dominick) Milone, born in 1898. He married Elisa Coppola. They immigrated to the US and resided in Rockville Centre, NY. Thank you for your time. I have done research into the male line of my family (Sirica) going back 12 generations to Giuseppe Sirica born in Sarno about 1560. I am wondering if anyone knows if there is any relation to the family that owned the House of Sirici found in the scavi of Pompeii. The River Sarno flow into Pompeii when it was a port town. My father’s parents, both Sirica’s Are from Sarno. I recently visited Sarno but arrived too late to browse the through the records. My situation is unique as my grandmother married her first cousin. Her dad’s name was Salvatore Sirica 9/16/1866 and his brother, Vincenzo Sirica was my grandfathers father. Their dad was Francesco Sirica 1/25/1829. His father was Raffaele Sirica DOB unknown. When I visited Pompei I was looking for la casa Sirico. I recently read an article by father Robert Sirico and I am curious as well. I am Fr. Robert Sirico and my grandfather was Salvatore Sirica (the o and the a change from generation to generation; it seems it was not standardized), but he was born Jan. 3, 1887, so I believe they are different people. My mother, Filomena Anna Collaro, was born in Sarno, Italy, on June 24, 1909, the daughter of Sebastiano Collaro, and Anna (Zita?) Collaro. I would like to obtain an official record of her birth. How do I do this? I am trying to find the names of my great grandparents: Grandparents were: Silvio Salerno (b. 1884) married Maria Annuziato (b. 1888). It appears both were from Sarno, Italy. Not sure whether they married in Italy or in New York. Grandfather emigrated to NY in 1909..not sure when Grandmother did. Also if they had any siblings. Thank you for your time. I am trying to find family history of My 2x great grandparents. Carmino Raimo and Vincenza Lucia Annunziata who were married and lived in Sarno, before coming to the United States in the early 1900’s (1900-1904), first living in New York and then settling into Jersey City, NJ. They arrived with their two children, Angelo and Cristina Raimo, and eventually had two more children. Vincenza died in the flu epidemic of 1918 and Carmino died a few years later. I am also interested in the names Catalano and Munziato. Thank you. Hello. I’m looking for information on the Corrado’s in Sarno. My grandfather was Gaetano Corrado, his parents were Ferdinando and Voncetta Balestrino. Great grandparents were Girolamo and Laura Russo. I’m also looking into a possible relative Enrico Corrado, married to Maddalena Esposito. Any help would be much appreciated. I am looking for information on Antonio Robustelli and Speranza Gaudiello. I am interested in their marriage dates and dates of birth. I am looking for information about the Robustelli Family. Specifically Gennaro (or Genardo) Robustelli and his wife Ceclia. They had at least 4 boys that immigrated to the US around 1904. I was wondering if there were more children? and if there is anyone left in Sarno that is related to them. Trying to flesh out my family tree. I am searching for my gg-grandfather, Antonio Crescenzi, born January 1854, father Ferdinand? mother Francesca. Possibly married to Crustata Cunini? Had a daughter Francesca born in 1879. Looking for information on GGfather, Francesco Polichetti born 1877 in Sarno. Mother Carmina Giordano, Father Carlo Polichetti. I am a descendant of a long line of Nunzio Squillante’s from Sarno Italy ( Actual spelling coming into Ellis island Squillanti). Looking to speak to relatives and also obtain a birth certificate for my Great Grandfather. Hello, I’m trying to find more information on ancestors from Italy. My great grandparents were Luci (Dorgetta) Albero and Gabriel Albero. Both were probably born in the late 1800s and immigrated to the United States in the early 1900s. . Any help would be much appreciated. Thank you! I am trying to find information on my great-grandparents who came from Sarno. My great-grandfather was Luigi Defilippo, born about 1858. His first wife, my great-grandmother, passed away in Italy, and he remarried, to Lucrezia Farina. I would like to find who the first wife was, and what happened to her. I don’t even know her name. She must have died young, and is possibly buried in Sarno. Looking for information regarding my grandfather born in Sarno around 1890-his name is either Emilio or Eusebio Mincio-mother was Marie Mincio, father Antonio Defilippo. I am planning a trip next year as part of my 50th wedding anniversay celebration-going to Veleggio sul Mincio–is there a family connection with my last name to that area? I am looking for birth and death dates, basically any information of Alfonso Laudisio (Landisio) and his wife Coletta. I believe her maiden name destefano. They had a son Giovanni in 1875. Giovanni passed away in NY 1911. I don’t know of any other children. Researching my maternal grandmother and grandfather’s families that I know come from Sarno. I want to get all the possible records that I can. I am looking for information on ancestors from Sarno, Italy. My great grandfather was Vincenzo Annunziata born 15 Nov 1848. His wife was Giulietta “Julia” Campanile born 6 December 1865. They emigrated to the US in 1885. My great grandmother was Lucia Manfredonia of Sarno. All I know is she was born around 1850 and was living in sarno in 1910 becuz my grandfather listed her as nearest relative on Ellis Island ship manifest. Any connection? Thanks. I have Manfredonia ancestors from Sarno, too. I’d be happy to trade information and see what we can find out! I don’t have ancestor first names on hand right now, but can look that up later if you’re interested. My grandfather was Andrea Sedia, born january 25 1898. His parents name on passport – Antonio and Rachele Cioffi? Any insight? I am researching my family, Annunziato. My Great-grandfather Ferdinando was born 1878, he married Rosa Mancuso, he had a brother Emilio, I believe, other brothers too, his father was Nicholas Annunziato. Thank you for any information! My ancestors are Mancusos from Sarno. The closest known relative I can trace from Sarno is Paulo Mancuso, born in 1893. His parents were Gennaro and Anna (maiden name Devivo) Mancuso. Genneral and Anna had two other sons, Giovanni (John) and Eugenio (Eugene). He married Rafaela DiNardo (also from Sarno). We’re related. Have you tried Facebook group Descendants of Gennaro Mancuso and Anna DeVivo? I am researching my family from Sarno, Italy–surnames include Manfredonia and Annunziata. My GGrandparents were Lucia Manfredonia and Antonio Annunziata born about 1850. My grandparents were Enrico Annunziata and Angelina Marrone or Marzone birthdates around 1875. I am researching my husbands great-grandparents who came from Sarno. Their names were Martin Annunziata and Clorinda Somma. Their birth date were around 1850. Who do I write to or e-mail for their records. I will appreciate any and all help. Thank you. Hello Cami, My grandparents were also from Sarno and the place of birth on my grandmothers application for Naturalization states the town Episcopio Salerno, Italy. Perhaps our grandparents knew each other! My grandfather came to America in 1922, my grandmother, 1912. I wish you luck on your search. If you have any information about the town or the area I would appreciate it if you would let me know. Thank you. Your Berardino was son of Antonio DiNardi (1860–1903) and Amalia Basile, who married in 1885 in Sarno. Antonio was son of Berardino DiNardi and Luisa Salerno, my G-G Grandparents. My G-grandfather Pietro DiNardi was Antonio’s brother. Thank you Marin. Do you happen to know if Berardino DiNardi and Luisa Salerno had any other children? searching ancestors from sarno and naples Italy. Luigi squitieri born 1932 in sarno I think. his wife Rosa Dato born ? 1937 in naples I have been told. Their oldest daughter is luisa. Luigi’s father was Antonio Squitieri and mother Luisa Baselice. Rosa’s father was Vincenzo Dato. any info would be appreciated. I am searching for birth records for my grandfather, Franceso Caruso, who I think was born in Sarno. Six of his nine children were also born in Sarno. He was married to Giovanna Buonanto. I believe my grandfather and grandmother were born in Sarno. His name was Carmine Rosario Annunziata born 2/12/1872 and her name was Filomena Esposito. They married in Italy and came to America around 1902 but I could not find any record of them at Ellis Island. My mother’s father Giatano D’Ambrosio was also born in Sarno. I know Carmine had at least one brother who did not go to America.Thank you for any assistance you give me. I am trying to locate my family’s city of origin in Sarno Italy. may have been changed at Ellis Island. Camine Orza (Orzo) would have emigrated to the US early in 1900’s. I am trying to find information on my ancestors who I believe are from Sarno, Italy. My great-grandmother’s name was Michelina Odierno and she was born 12/27/1904. Her parents names were Luigi Odierno and Antoinette Campanelli. Thank you for your time. I am trying to find information on my ancestor. Filomena Esposito (1848) married with Francesco Avallone (1851). Their son named David Avallone 8-12-1872 was the grandfather of my mother. Thank you for your time. If you would like to start a research in Sarno please send your request to sarno@italianside.com.